Sometimes we buy phones and gadgets just because we like the look of it, or are tempted by the product or even because we know somebody who bought one, and we also want one. But wouldn’t it be good if we could buy technology with a purpose that all integrated properly. Above is a screen shot from my dashboard view on the FitBit app. This is a cross platform app that can be installed on android, iOS, Windows Phone and viewable via the web too. It is reading data from my FitBit Charge HR. (my review of the FitBit Charge HR https://gavinsgadgets.com/2015/02/17/fitbit-charge-hr-review-including-using-it-with-myfitness-pal/ ) . I am using the FitBit Charge HR to help me lose weight and get fitter. This piece of tech does exactly what I need without any unnecessary frills. It also has intelligent software. Above is a route I walked but as it was across Dartmoor it is not very detailed. A word of warning. If you instruct the app to start an exercise, it uses your location (GPS) from your phone. As I was on Dartmoor, there was no cell reception, so it warned me it hadn’t got a fix yet, but I overrode the warning and hit the start exercise button.If I had waited a few more seconds it would have got a fix. After 20 mins, it showed that I had walked 9.1 miles. Miracle or mistake 🙂 Now, this is where the FitBit software was clever enough to allow me to delete that one route, and after a sync with the internet a bit later, it corrected all the data and adjusted the step, calories and everything else on my dashboard. I restarted my exercise, this time being more patient and getting a GPS fix first before hitting the start button. So all was going well until I reached a place called Laughter Tor. The weather had suddenly turned for the worse. It was already minus 2 degrees centigrade, but now dense fog had appeared and it was impossible to see ahead. And this is where I used another piece of technology, an app called Viewranger. Again this app is cross platform. 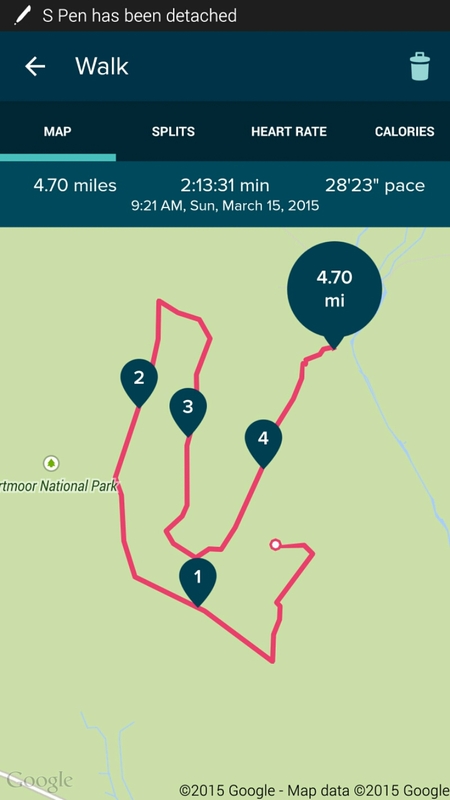 I have a proper OS map of Dartmoor and began to use it to track my route and plan my route ahead. Below is a screen shot showing the path I walked. 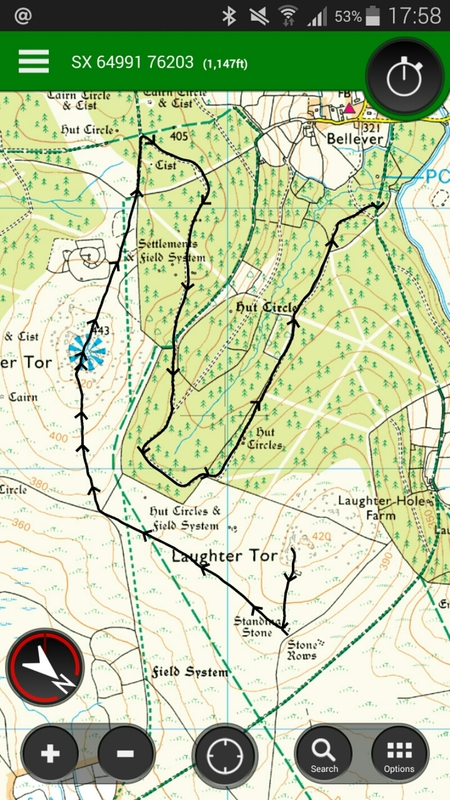 One of the clever features of the app, is the ability to trace back the route walked, and at one point due to the deterioration in weather this was an option. Also as the map is an OS map, elevations are clearly marked. 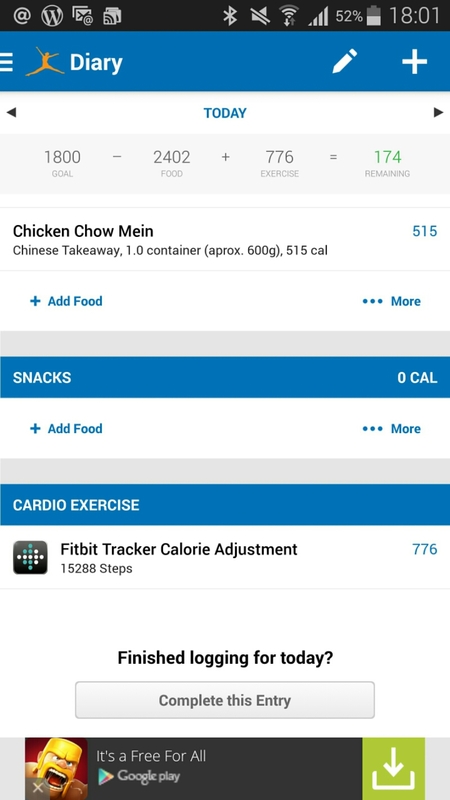 And finally, the last part of the tech puzzle, is food and drink managed by MyFitnessPal. 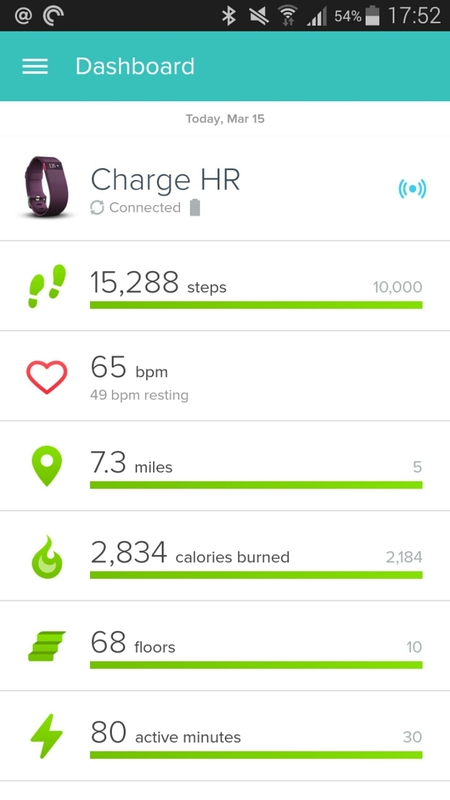 Note the entry at the end, showing the FitBit steps adjustment. This can add to your total allowed calories or deduct if you are having a lazy day. All the above software and hardware is managed by my Samsung Note 4. It’s high quality screen and size help with the map tracking too and its battery longevity was excellent as well. It feels great when everything works so well together!